Merchant adoption is growing and there are big players like CheapOAir, Overstock.com and Subway that accept cryptocurrency as a form of payment but we're still a ways away from critical mass just yet. You can't use cryptocurrency at many retailers and most retailers need to pay their costs in fiat currency. It's a chicken-and-egg scenario. So until merchants can pay for at least some of their expenses in crypto they need to convert the crypto they receive to fiat. There are only a handful of companies that can facilitate this, and we're well positioned to be among them. Cryptocurrency is still quite volatile because there are far less people that hold some compared to fiat currency. This will change over time and arguably some cryptocurrencies are already looking more stable than fiat currencies like the Venezuelan Bolivar and Argentine Peso. However, currently most retailers do not want to take on this volatility risk. As a result, the cryptocurrency they accept needs to be instantly converted to something more stable. This is something we've been working really hard on. Sending, receiving and converting cryptocurrency is still quite time consuming and requires a decent amount of technical know-how. In order to reach mass adoption it needs to be at least as easy and fast as current payment mechanisms, if not better. At Bidali, we're building tools for developers and end users that accomplish this goal and make it as easy to send, receive and store various cryptocurrencies as it is Canadian and US dollars. To allow people to use their cryptocurrency to buy high quality goods and services from top brands without waiting for them to adopt crypto payments. To dog-food our Payments platform so that we can make sure it is ready for prime time and demonstrate to merchants how easy it is to integrate. 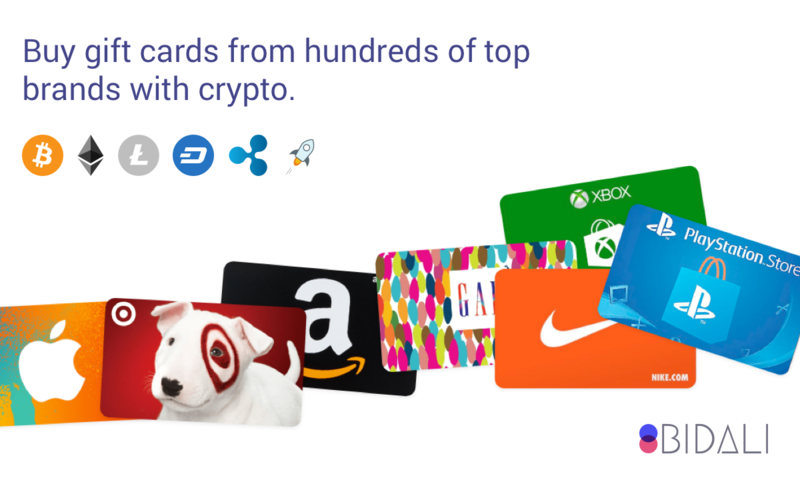 At first glance it may seem weird to have to go from fiat -> crypto -> gift cards. We'll admit that adding extra step in between the merchant and the buyer is still a bit cumbersome. The ultimate goal is to go direct to merchants. However, while we continue to drive merchant adoption we see gift cards as a great bridge technology. We'd love for you to give Bidali Gift Cards a try and let us know what you think. Feel free to Tweet us feedback. If you're interested in accepting cryptocurrency as a form of payment and reducing your fees you can contact our sales team. We'll be launching with some of our first merchants later this year.